Their decisions will shape a nation in ways neither could have anticipated. Defending Lian against soulless assassins is not what Aralt “Wolf” syr Tremayne agreed to. Nor did he agree to be the guardian of an irrational teenaged Keeper of the Faith. And he certainly did not plan on sky pirates or cannibals. Aralt has his hands full. The Grand Meeting of the Northern Alliance is mere days away and Lian Kynsei, last of the soul-touched and missing for three years, turns up on his doorstep. A noble man of his word, Aralt has every intention of protecting his ward, but did he have to show up now? What’s worse, the more they get reacquainted, the less Aralt likes him. He’s reckless, emotional, and when he’s angry even the weather changes. This is the hope of a nation? Armed with the Tuned crystal sword that is all he has left of his murdered brother, Aralt endeavors to secure a sanctuary for a reluctant heir-apparent who never anticipated his elevated status while also trying to convince everyone around him that he doesn’t want the job either. But sanctuary proves elusive, every step bringing them closer to danger–and closer to revealing secrets neither wishes to share. The enemy has made the skies their own and unleashed a scourge intent on killing Lian–or worse. Death, Aralt realizes, might be the greater mercy. In the world of OATH SWORN, cultures and ideologies clash, jewelers “Tune” crystal swords, skyships sail above tidal extremes, and the soul-touched–like young Lian–inspire both awe and fear. It will take more than determination to survive the adventure upon which Aralt and Lian embark…more than devotion to a sacred oath. It will take courage–and no small amount of faith. 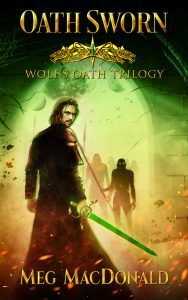 OATH SWORN is the first book in the Wolf’s Oath Trilogy. Meg MacDonald is a time traveler from beyond the Stellian Galaxy, but she pretends to be a life-long Michigander and SFF geek whose first crush (after her daddy) was Mr. Spock. This explains a lot. She began writing the stories that would lead to Oath Sworn and the Wolf’s Oath Trilogy when she was in high school. A lot of writing and many distractions followed. She has trained dogs and horses, rescued cats, renovated old houses, gone spelunking, and fostered children. Her husband thinks she’s cute, her kids think she’s weird, and her cats just want her for her lap. She loves woolly mammoths, Coca-Cola, Irn Bru, men in kilts, and has never been to the moon, but hope springs eternal. Meg’s short fiction and poetry have appeared in a variety of pro, semi-pro and charity print and online anthologies and magazines including Weird Tales, Masques of Darkover, Four Moons of Darkover, Domains of Darkover, The Temporal Logbook, and The One Million Project. She was editor-in-chief of the semi-pro SFF magazine PANDORA back in the day and credits that experience with nurturing her love of short fiction, honing her critical skills, and probably delaying her writing career by at least a decade. But that’s okay. She reckons that time has made her a better writer. Book II in the Wolf’s Oath Trilogy is scheduled for spring 2019.